Norma was born May 27, 1916 in Danbury, Iowa to Charles and Belle ‘Smith’ McCleery. 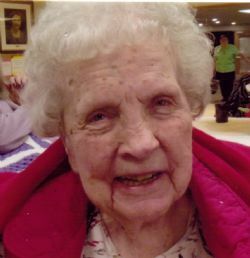 She was raised in Danbury and graduated from Danbury High School in 1933. After high school she married Joseph R. Simmons. The couple lived in various places including Iowa City, Omaha (while Joseph was in Medical School), Hooper and eventually in Fremont. Joseph died in 1962. Norma worked for 18 years in the medical office of Drs. Yost/Keasling/Dilley retiring as Office Manager. Norma married Robert Bailey in October of 1976. The couple loved to square dance and travel. Bob died August 22, 2015. Norma had been a member of Faith United Methodist Church while living in Hooper, she was a member of the First United Methodist Church in Fremont. She had been a member of the Arbor Vitae Chapter 92 Order of the Eastern Star of Fremont. Norma was loyal to her family to a fault. Sandra (George) Looschen of Lone Tree, CO.
Joseph (Debe) Simmons of Abingdon, VA.
Norma is also survived by those in Bob’s family. Norma was preceded in death by her husbands and 11 siblings. The funeral will be 10am Friday at the First United Methodist Church. The Rev. Melissa Gepford will officiate. Burial will follow in Memorial Cemetery. Memorials are suggested to the Priscilla Flower Mission of the First United Methodist Church. Visitation will be on Friday one hour before the service.